Ormiston boss Richie Weir has told his players to wear the club’s shirt with pride this weekend as they prepare to bring the curtain down on their current pitch at Recreation Park. 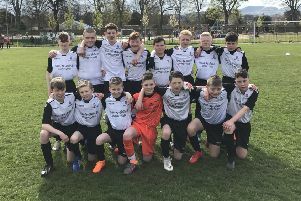 Ormi welcome champions Leith Athletic to East Lothian on Sunday (12.15pm kick-off) for one final time before they begin next season on a newly-built pitch which has been rolled out just a couple of metres from the present surface. As a local lad who used to play for the club himself, Weir says the current set-up have been playing there since the 1980s. “We’ve said to the guys this week at training that this Sunday is more about the club and to put in 100 per cent,” Weir said. “We know it will be a difficult game but for once this isn’t about the players. “Everything is in place for next season, it’s just the changing rooms that are still to be installed which means we might have to play our first few games next season away from home. Weir’s men succumbed to an 8-0 thrashing from Leith in a King Cup first-round tie last weekend, a performance the manager himself called “embarrassing”. He is, however, hopeful that a similar scoreline isn’t on the cards when Derek Riddel’s side visit on East of Scotland League duty this time around. “It was a very dark day last week,” he admitted. “Leith video their games and put them up on YouTube so I told the guys to go and watch the highlights from last week and, if the truth be told, it was embarrassing. Lothian Thistle Hutchison Vale are at Eyemouth United tomorrow and Tynecastle are also in the Borders with a trip to Coldstream.